Bottom Line: a newer iteration of a longstanding classic and favorite among the audio community. Best suited for near/mid-field listening. Comparatively expensive for the specs, but still might be worth the premium for some. *When nominal/RMS power isn’t specified by manufacturer, we use an approximation of ~30% of the specified peak/dynamic power for comparison purposes. Wharfedale is a boutique British audio company, and the Diamond series speakers have been their flagship product since the early 1980s, with many different iterations of such having come about since then. The Diamond 200 lineup was released circa 2014 and contains several different types of home theater speakers, including three different sized bookshelfs which we’re reviewing herein. The Diamond 210, 220, and 225 vary slightly in size and power and have different sized woofers: 4, 5.25, and 6.5 inches respectively. Otherwise they have the same build and aesthetic design. The power and efficiency specs are modest. That doesn’t necessarily mean worse sound, just that a standalone pair of Diamond 200 bookshelf speakers will probably be best in a desktop near/mid-field setting. These speakers use a 2 way design (most common amongst bookshelf speakers), meaning you’ve got a single midrange woofer and a tweeter. 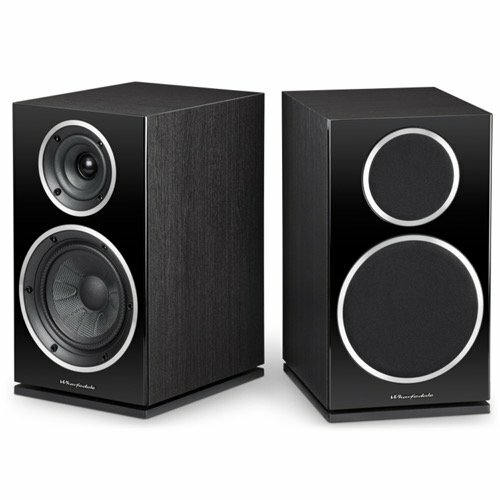 The larger 225’s response floor is actually quite decent for a 2-way speaker, but bass reproduction will always be limited without a subwoofer with a dedicated crossover. 2-way speakers can sound fine on their own sometimes, but they’re generally designed to work in conjunction with an external subwoofer, whereas 3-way speakers generally suffice without one. The Diamond 200 Towers (review forthcoming) are actually 3-way speakers and also have significantly more power handling, and we thus assume they’re intended to be the main satellite speakers in a sound system. The tweeter is a soft dome and the woofer is a woven paper blend – well built soft/paper drivers are highly performant, especially at lower volumes and closer range, but are more prone to damage or general wear and tear. Weirdly we couldn’t find any information on the warranty of these speakers, but we assume it would be in the standard range of 3-5 years. We sent an inquiry to the company to clarify the warranty and will update this review when, hopefully, we get a response. Update: Wharfedale has confirmed via email that the warranty on their passive speakers is 5 years. The Diamond 200 speakers have a pretty classic look with the embedded drivers with the chrome bezel. The removable covers merely go over the cones and the baffle remains exposed. They come in four colors, classic black and white and cherry/walnut mock wood. The perpetually tinkered and upgraded Diamond speaker has been around for a while and has, over the years, received a lot of praise and favor within the audio community. They’ve also become discounted from the MSRP to make way for newer generation iterations. Still though, the Diamond 200 speakers are comparatively expensive for the specs, and there are many similar alternatives (a lot of them having been subsequently released) for a fraction of the price. As we often say, these will probably come down to a listening test. Check out the links below for some less expensive alternative recommendations.